The Brambling is sometimes described as the Chaffinch of the north, for in the pine and birch forests of Scandinavia it seems to replace the Chaffinch as the commonest bird. 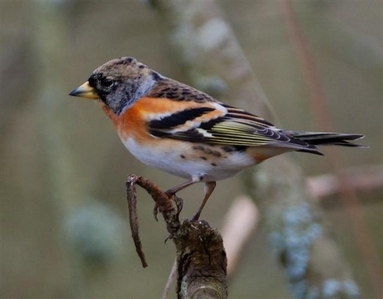 In all plumages, Brambling can be recognised by the obvious orange on the breast extending across the shoulders onto their wings. In winter the head and mantle are usually a blotchy grey-brown but in some birds these wear away to produce a stunning black head, even before they depart back to their breeding grounds. In flight they show a neat rectangular white patch down the rump as well as white and orange in the wing. All Brambling are migratory. They breed from Fennoscandia, through Siberia to Kamchatka and migrate to relatively warmer climates to winter in western and southern Europe, Turkey, Central Asia and northern India. In winter, vast flocks are formed where food is particularly abundant, for example seeds of beech trees. Some large roosts have been estimated to contain over ten million birds. The number turning up in Scotland each winter varies greatly from year to year depending partly on the successfulness of the breeding season and the availability of food on the migration routes. On Arran in the previous five winters, only one winter has had more than two or three records of Brambling. It was the winter of two years ago that we last had an influx of this migratory bird. That winter there were thirty five records between 26 October 2010 and 3 April 2011. The largest groups were over twenty. Will this winter be a "Brambling" winter? There have already been two records in October in Arran plus a range of reports from the adjacent mainland so check the Chaffinch flocks around your area for this colourful winter visitor.